Attached is a sneak peak of the MASSIVE 15 ft. freeway sign being installed on Route 60 Freeway. 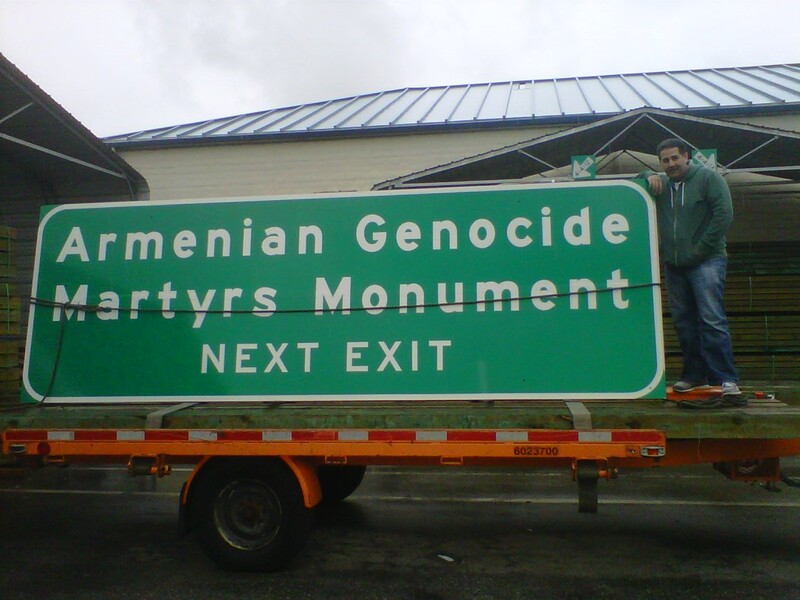 On April 1st 2011, the State of California will have in place along the 60 Freeway a sign noting the “Armenian Genocide Martyrs Monument” near Montebello, this will be the first time the word “Armenian Genocide” will permanently be inscribed on US soil. The monument sits at the top of Bicknell Park in Montebello and is the first and only monument to our ancestors on public land in the world. The monument will become a historical landmark in 2015, Ironically 100 years after the first genocide of the 20th century. There are more events to follow, this year’s April 23rd Vigil will feature Element Band, Zulal Band from New York and Raffi Semerrdjian as well as featured guest speaker Former Armenia Ambassador to Canada Ara Papian. This event will take place from 7-11pm on April 23rd. Stay tuned for upcoming events, log on to Armenianmonument.org and follow us on facebook at Armenian Genocide Martyrs Monument. Looking forward to all of you joining us in keeping the Armenian spirit alive. This entry was posted in Armenians In America, Articles & Press, In The Community, News. Bookmark the permalink. Happy to see any movement towards the issue! Thank you! Excellent! We should all be very proud of this accomplishment. Thank you to those that worked on getting this done. It’s great to know that people can acknowledge this history of the Armenian culture. It’s great to know that people can acknowledge the history of the Armenian culture. The installation of the sign was truly a Historic Event!!! It is not just a freeway sign, the word “Genocide” already has an enormous meaning itself, and Knowledge is definitely Key for our future… Sincere gratitude to everyone that worked so diligently to make the installation of the sign possible!!! I do not mean to give offense by this question, and if it reflects some ignorance on my part as to what occurred, please let me know, but why is the word “Martyr” used? It is my understanding that the word “Martyr” typically refers to being put to death rather than renouncing one’s faith, after being provided an opportunity to do so; it is intrinsically an individual sacrifice. Genocide refers to the killing of a population, as such, without reference to any individual chance of exemption; it is inherently a group action. Victims of genocide are not “martyrs”; one would not refer to the Jews exterminated in the camps, or the American Indians subject to relocation and killing during the opening of the American West as “martyrs”. What is the reasoning behind its use in this instance?